Many insects have ears, but few researchers have investigated why. Until now. A new study shows that the ears of some insects, including moths and butterflies, may function as "bird detectors" that are able to perceive the wing flaps of avian predators. Crickets use their ears to communicate, while moths use their ears to detect the ultrasonic calls of bats. But the purpose of other insects' ears, including those of butterflies, has remained a mystery. "Many of the butterfly taxa have really well developed ears at the base of their wings," said Jayne Yack, a biologist at the Carleton University in Ontario, Canada. "But we really don't know what the function of their hearing is." Yack and her colleagues have been studying butterfly ears for years and have previously discovered that the insects have pretty sensitive hearing, particularly at the low frequencies, for whatever reason. They also know that only very few butterfly species can produce sound for communication, and that most butterflies are diurnal (active during the day), so they don't have to worry about hungry bats. Still, having sensitive ears for predator detection makes the most sense, Yack said. "So what sounds are their predators making?" she told io9. "Birds are probably not going up to butterflies and going 'cacaw-cacaw.'" Instead, Yack reasoned that butterflies and other insects may be able to hear birds' foraging sounds — the flapping of their wings, in particular. To test this, Yack and her team recorded the sounds of Eastern Phoebes (Sayornis phoebe) and Chickadees (Poecile atricapillus) while they were hovering in front of tethered moths and butterflies. The sounds, they discovered, where broadband (encompassed many frequencies) and pulsed with the birds' wing beats. "The sounds are passive cues —they are a side effect of movement," Yack explained. "They probably don't differ much from bird to bird." Next, the researchers decided to determine if noctuid moths (Trichoplusia ni) and nymphalid butterflies (Morpho peleides) — which represent insects with high and low frequency hearing, respectively — can hear the hovering birds. By looking at the hearing spectrum of the insects, they discovered that the frequency range of the moths' hearing overlaps with the high-frequency component of the bird flight recordings, and the butterflies' hearing overlaps with the recordings' low-frequency component. The team then hooked up electrodes to the insects' auditory nerve cells and watched how the nerves reacted to the bird recordings. They found that both the moths' and butterflies' auditory nerves responded in a "bursting pattern" that matched the pulses in the birds' wing beats. After analyzing the data, they estimated that the insects could amazingly hear the approaching birds from at least 2.5 meters (8.2 feet) away. It's clear from the study that insects can hear the flying birds, but the scientists have yet to experimentally show that they use this ability to escape being eaten. Regardless, the team believes that some insect ears do function as bird detectors for several reasons. First, the bird flight frequencies overlap with the hearing of a lot of insects, including cicadas, butterflies, grasshoppers, moths and mantises, all of which are preyed upon by birds. Second, many insects exhibit the "mismatch phenomenon," where their ears are most sensitive to frequencies not used in communication. For example, Cyphoderris crickets communicate at 12 kHz, but they hear best at 2 kHz, suggesting they use their ears more to listen for predators (birds are the primary predators of these crickets). Finally, previous studies have shown that moths hear and escape from birds that are rustling through bushes — Yack and her colleagues suggest that flight sound cues could "play a role in mediating this escape response." Aside from investigating how insects respond to bird flight sounds in the wild, the researchers are interested in testing whether birds have developed counter strategies to help them catch their listening prey. For instance, in their experiments, the team saw that a pair of wild phoebes would initially hover for a while in front of the moths and butterflies, which they've never encountered before. But as they became familiar with the insects, they significantly reduced their hover time and instead quickly grabbed their prey, giving little warning. 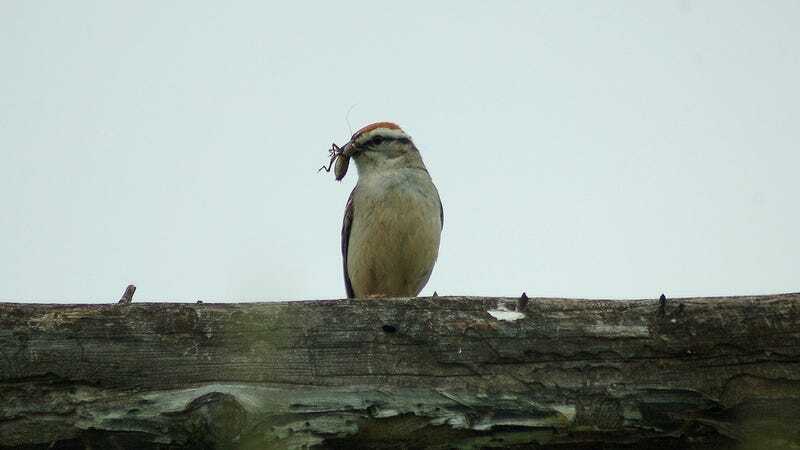 In a similar vein, could insect specialists, such as swifts and barn swallows, have developed their foraging strategies to work around their preys' keen hearing? "These birds are very graceful and they glide in when approaching an insect," Yack said. "They are not fluttering at all and probably produce very little sound that the insects could hear." Read the full study — aptly titled, "If a bird flies in a forest, does an insect hear it" — over in the journal Biology Letters. Top image via Carly & Art/Flickr.